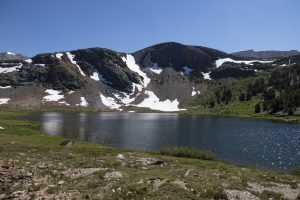 This high mountain lake is surrounded by flower meadows and multi-colored, crumbling mountains. The trail wanders through a mix of forest and flower-filled meadows. It crosses Dana Fork which may get your feet wet during higher water flow. It gently climbs up through an open forest until it comes along Parker Creek and its sublime meadow. You continue alongside the creek as you stay right onto the trail for Spillway Lake. The creek gets more playful as you gain elevation. After the gradual climb up, you enter the basin with the lake and monstrous mountains towering above. Wide, grassy meadows border the lake and frequently attract deer. For a longer day, consider heading up to Mono Pass and/or Parker Pass (see Mono Pass). Trailhead: The signed parking for Mono Pass is located off the Tioga Road 6mi/9.6km east of Tuolumne Meadows.